Is it possible your mother had an illicit affair with Frank Sinatra the year you were born? It’s impressive enough that you can analyse so many confusing facts, but pulling those facts together from so many years and sources continues to astound me. The “changes” DiFi pushes for may likely involve General Keith’s offspring ending up in a trusted friend or friends boarding school. Or the DEA’s mainframes. Yet to see or hear change I can believe in. @guest: The thought of mom having an affair w/Frank Sinatra is … improbable. So just to check the logic here. 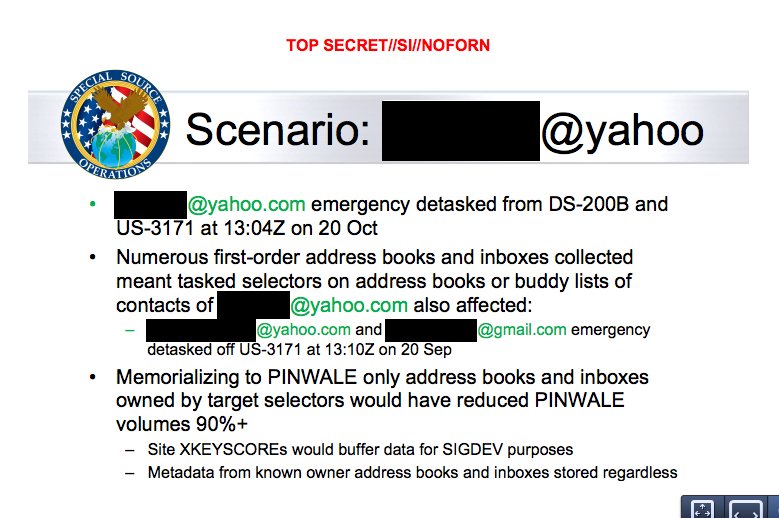 The NSA operates on the widely repeated principle of “owning the haystack” so that they can find the needles at will. But when just one target has his account hacked (or covers his activities with viagra ads) the whole thing blows up and they miss everything? When the hell is somebody in power going to wake up and put these criminals behind bars where they belong? Those in power today see it as their advantage to support the surveillance state, and few oppose it. Since NSA funds or subcontracts to CGHQ and ASIS, they may be able to expand their surveillance of US citizens so NSA can state any suvelling of our citizens was a mistake, even as they keep externally obtained info. Whether usable US centric intel passes to the NAS, who would tell. Same if it’s used in prosecution of criminal defendants. My email provider, Northern Virginia based Network Solutions, maintains its email servers in Canada, conveniently across the border. I expect Net Sol is not alone. We have not heard much about them, but the Canadians are one set of the Five Eyes along with the Brits, Aussies and New Zealanders. Funny that “overseas collection apparatus” doesn’t have to involve actual “water”. The Iranian had “a number of Yahoo groups in his/her contact list, some with many hundreds or thousands of members.” Bet 3 hops on that clogged up the works pretty good. Didn’t the Aussies also grab from a Malaysian server the now legally-eliminated nontel that a Brit ‘merc’ firm was thinking of planting Russian gas weapons in Syria to help make an ‘incident’? They’re good. They’re very good. Toss annuveh shrimp on the Barbie. @lefty665: Wouldn’t it be insecure to give you my bank information here, where everybody might see it? Won’t you give me your email address? I think we can do bidnis. @Bladur Dasche: Perhaps we could have a third party hold all the information for us. I hear there is a place on Beef Hollow Rd in Bluffdale UT that does that kind of thing. They may well have it all already. the mighty (and mighty invasive) nsa experienced a form of denial of service attack? i hear the lights go on and off there all the time. @orionATL: Well, if that one isn’t the right choice, we could try the home office in MD or other major regional offices in GA, TX, CO. If Bladur is overseas, there are branch offices and international affiliates in many countries. They have also made major efforts to establish web based operations. Although they have not advertised much, you run into them everywhere. They pretty much own the cloud. interesting you mention the cloud. my wife and i were wondering just this morning if nsa just went out and helped themselves to whatever we might have stored on the cloud. it sounds like the answer to our question is: yes. And, because it’s cold, they don’t need air conditioning at the Europa installation. Cuts the power requirements considerably.